In 1954, Coltrane’s expanding heroin and alcohol addiction cost him playing jobs, most notably a significant one with alto saxophonist Johnny Hodges. After moving back to Philadelphia, Coltrane was forced to play with local R&B bands to make ends meet. In some of these bands, he had to honk away on the tenor while walking along the bar. One night, he saw childhood friend and tenor saxophonist Benny Golson enter the club. Mortified, Coltrane climbed off the bar and walked out for good. I don’t know where it started. It didn’t start with the jazz artists, per se. It started with one of the entertainers. An entertainer’s plot is to do or to second-guess what the audience wants to hear. Yeah, I got involved in that. I did some crazy stuff when I was doing all that stuff. You do what you think is going to entertain them. It’s going to bring acclaim to what you’re doing. Yeah, what’s more ridiculous than getting up on the bar where the drinks are and start playing your low B-flats no matter what key you’re in, just honking. We call that honking and stepping. They’re applauding. Ain’t nothing happening. Stepping over those drinks. Music historian Ashley Kahn won the 2015 GRAMMY for Best Album Notes for Offering: Live from Temple University. Yasuhiro Fujioka, founder of the John Coltrane House of Osaka, uncovered the long lost audiotape of John Coltrane’s last performance in Philadelphia. 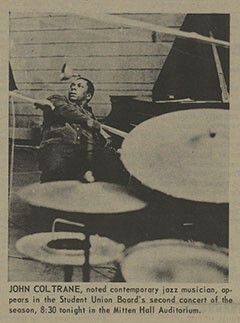 The Nov. 11, 1966 concert was aired live by WRTI, Temple University’s student-run radio station. To purchase the album, go here. Marcus Shelby is a perennial Bay Area jazz favorite who’s compositions explore the African American experience. Shelby finds deeper meaning for his work sharing the music he loves and its history with young people in schools and juvenile halls. Learn more about Marcus Shelby. One night, in 1939, Billie Holiday stood on stage in New York City and sang a song that was unlike anything anyone had heard before. ‘Strange Fruit’ was a musical lament against lynching. It imagined black bodies hanging from trees as a dark fruit native to the South. Here was a black woman, before a mixed audience, grieving for the racist murders in the United States. Immediately after, Billie Holiday received her first threat from the Federal Bureau of Narcotics. Harry had heard whispers that she was using heroin, and—after she flatly refused to be silent about racism—he assigned an agent named Jimmy Fletcher to track her every move. Harry hated to hire black agents, but if he sent white guys into Harlem and Baltimore, they stood out straight away. Jimmy Fletcher was the answer. His job was to bust his own people, but Anslinger was insistent that no black man in his Bureau could ever become a white man’s boss. Jimmy was allowed through the door at the Bureau, but never up the stairs. He was and would remain an “archive man”—a street agent whose job was to figure out who was selling, who was supplying and who should be busted. He would carry large amounts of drugs with him, and he was allowed to deal drugs himself so he could gain the confidence of the people he was secretly plotting to arrest. In 1987, Congress passed House Concurrent Resolution 57 designating jazz “a rare and valuable national American treasure.” The resolution recognized jazz as a “unifying force, bridging cultural, religious, ethnic and age differences.” Indeed, jazz played an important role in paving the way for the Civil Rights Movement. The Downbeat, located at 11th and Ludlow streets in Philadelphia, was the first racially integrated club in Center City. The building is still there. Café Society Swing, written by Alex Webb, tells the story of the legendary Café Society, the first integrated nightclub in New York City. The jazz spot played host to, among others, Fats Navarro, Dizzy Gillespie, Charlie Parker, Count Basie, Sarah Vaughn, Lena Horne, Sister Rosetta Tharpe, Ida Cox and Big Joe Turner. Philly Joe Jones was the house drummer. The Café Society is where Billie Holiday first sang “Strange Fruit” in January 1939. Later this year, Netflix will debut an original documentary about Nina Simone, What Happened, Miss Simone? The film was screened at the Sundance Film Festival. Beginning with footage of the singer staring down an audience at the Montreux Jazz Festival in 1976, What Happened goes about answering its question by flipping back to Simone’s childhood, detailing her early musical ambitions to be the first black female classical pianist. Despite her talent and the financial support of well-to-do patrons, she was rejected by the prestigious Curtis Institute in Philadelphia; that “early jolt of racism,” as Simone referred to the incident, became the first of several events to fuel an inexhaustible supply of anger at society. A summer gig at an Atlantic City bar gave birth to the blues chanteuse she’d eventually become, with the film tracing her rise to hit recording artist, jazz sensation, long-suffering wife (her manager/husband Andrew Stroud does not come off well), a major player in the Civil Rights movement, industry pariah, American ex-pat, playing-for-chump-change café performer and, eventually, a rediscovered legend. Until that visit, I assumed the Showboat was in the basement space with the two windows facing Lombard Street. As we descended the stairs, Dr. Allen said something was wrong. Back then, there was no landing between the steps. Instead, the club was down a steep set of stairs. And sure enough, after a bit of snooping, we found what remains of the original steps that led down to the Showboat. So imagine the likes of Billie Holiday, Miles Davis, Art Blakey, Cannonball Adderley, Bootsie Barnes, Philly Joe Jones, Jimmy Heath, Thelonious Monk, Dinah Washington, Ray Charles and Ramsey Lewis descending those steps to take their place on the bandstand that was behind the bar.